For centuries, Native peoples have been cooking with clay. In New Mexico, the most commonly used clay is probably micaceous, gathered locally and formed into cooking pots because the mica that naturally occurs in it is an excellent conductor of heat. Other types of clay have traditionally been used for making ollas, the Spanish word for ceramic jars in which to cook stews and soups, or to store water or dried foods. At Pueblo Bonito, the largest Ancestral Puebloan site in northwestern New Mexico’s Chaco Culture National Historical Park, archaeologists have found potsherds and other ceramics containing traces of theobromine, which indicates that cacao, or chocolate, was consumed in the Southwest from around A.D. 1000 to 1125, and proves that goods were traded between tribes of this region and those to the south. However, many scientists believe that pottery has been used in the Southwest since about A.D. 200. In the present day, Walter Whitewater, a Diné (Navajo) chef, who is an instructor at the Santa Fe School of Cooking and my partner in our catering company, Red Mesa Cuisine, remembers his grandmother talking of food being sealed in damp clay and placed in an open fire until the clay baked and split open and the food inside was cooked. This ancient technique of baking in clay has been used in his family for generations; here I give it a contemporary twist. In the recipe that follows, the trout is wrapped in cornhusks, which are sealed in a clay pod and baked in a very hot oven. The clay keeps the trout moist and melds the flavors of the green onions, herbs, and bacon. Once the fire-hardened clay has cooled, it is cracked open and the meal is served. This is one of the most delicious ways I know to cook fish. Furthermore, the clay can be saved, mixed with water, and used again for cooking. From New Mexico Clay, in Albuquerque, I buy 25-pound blocks of a nontoxic potter’s clay, Terra Cotta Cone 04 to 5—a mixture of clays from New Mexico and other regions. Lois Ellen Frank is the author of Foods of the Southwest Indian Nations (Ten Speed Press, 2002), an instructor at the Santa Fe School of Cooking, and a partner in the catering company Red Mesa Cuisine. She lives in Santa Fe. All recipes by Lois Ellen Frank. I usually serve each person a whole fish, but for a more refined presentation, serve fillets with side dishes of Sautéed Rainbow Chard and Hand-Harvested American Indian Wild Rice. SERVES 6 AS MAIN COURSE, OR 12 AS APPETIZER. Soak cornhusks in warm water about 10 minutes, until soft and pliable. Remove from water and set aside. Divide clay in six equal portions and cut one portion in half. On flat work surface or cutting board, use rolling pin to roll out, as you would pastry dough, each of the two lumps of clay to about ¼ inch thick. Make sure clay is about 1 inch larger than trout on all sides. Open each trout, and season inside with salt and pepper. Stuff 2 grilled green onions into cavity, then add 2 sprigs thyme and 2 sprigs sage (or 3 sage leaves). Fold trout halves together. Wrap two strips bacon around fish, one near the head, the other near the tail. Arrange two cornhusk sections with tapered ends pointing outward, to form a sort of cornhusk canoe. 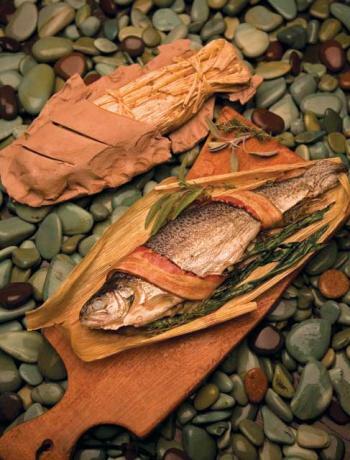 Wrap trout in husks, placing a third section of cornhusk on top. Overlap cornhusks so that no part of trout is exposed. Using cornhusk ties (rip one husk into small strips), tie cornhusk securely around fish at nose and tail, making sure fish is completely covered by husks. (You’ll need 3 cornhusks for each trout; depending on size, some may require a fourth husk.) Cornhusks help fish bake evenly and keep it from sticking to clay. Place both pieces of rolled-out clay lengthwise on work surface. Place cornhusk-wrapped trout on one piece of clay, cover with second piece, and pinch edges together to seal. With knife, make 3–5 slits in top layer of clay. Place on baking sheet and set aside. Repeat above steps until all trout are stuffed, wrapped in bacon and cornhusks, and sealed in clay. Trout is completely baked when color of clay has changed from dark to light; remove from oven. When clay is cool enough to handle, crack open with kitchen mallet. Clay will easily peel away from cornhusks and can be saved for future use. Serve trout whole in husks, or cut off head and tail, make an incision down backbone of each fish, and remove spine, resulting in two fillets. While the trout bakes, prepare your side dishes so that you can serve the meal immediately. In cast-iron skillet over medium to high heat, heat olive oil until hot but not smoking. Add chard and garlic and stir. Sauté 2 minutes, stirring to prevent burning. Add salt and stir again. Serve immediately. Manoomin, or heirloom wild rice, is a traditional food of the Ojibwa communities in northern Minnesota, Wisconsin, Michigan, and Canada. In a cast iron skillet over medium to high heat, heat olive oil until hot but not smoking. Add shiitake mushrooms and sauté 4 minutes, stirring to prevent burning. Add diced onion and sauté 1 minute, stirring constantly. Continuing to stir, add corn, and cook 1 minute more. Add cooked wild rice, salt, and pepper. Stir. Cook 2 more minutes or until completely hot, stirring constantly. Remove from heat. Serve immediately.